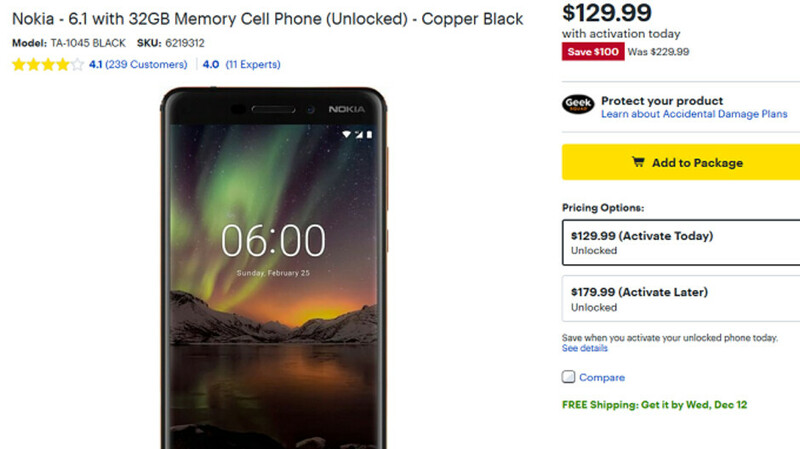 The Nokia 6.1 is on sale at Best Buy and B&H Photos (via Android Police) for $179.99. Those two retailers have the phone available in Black only. Now if you go to Best Buy and activate the phone on a new wireless plan, you can save an additional $50. That will take the price of the device down to $129.99. The regular price for the Nokia 6.1 is $229.99 at Best Buy and $269 at B&H. The Nokia 6.1 features a 5.5-inch LCD display with a 1080 x 1920 (FHD) resolution. The Snapdragon 630 Mobile Platform is under the hood along with 3GB of RAM and 32GB of native storage. A 16MP camera (f/2.0 aperture) adorns the back while a wide angle 8MP camera can be found in front. Keeping the lights on is a 3000mAh battery, and the phone has been updated to Android 9 Pie. Keep in mind that this is an unlocked GSM phone. That means among the four major U.S. carriers, the handset will be compatible with AT&T and T-Mobile. Verizon and Sprint subscribers will need to sit this one out.